Swimsuit season is here and our eyes have turned to all things stretchy, strappy and sand-worthy. We’ve noticed a real change in attitude when it comes to swimwear recently; fiddly straps, fussy shapes and pointless ties are going out of favour in the place of a more streamlined style. There’s a handful of brands who are doing it really, really well, and NU SWIM are fronting up the ranks. With their simple shaped cossies in a range of covetable colours, NU SWIM are so on point they’ve barely disappeared off our Pinterest feeds all year. This is partly down to their beautiful swimsuits, but also wholly due to their fautless art direction and imagery (next level moodboard-worthy). Designed and produced in sunny Cali, we had to get in touch with the brand’s founder, Gina Esposito, to find out a little more about how NU SWIM are making waves. How did NU SWIM first come to life and what was the initial idea behind it? I was feeling really unsatisfied with my career path - I kept taking one corporate design job after the next - at the beginning of my career the exciting design jobs were so few and far in between, so I ended up going down the corporate route to be able to survive. I never envisioned myself being such a small piece in a puzzle. I had wanted to start my own thing for some time, but could never grasp a concept that I could afford - I always wanted a full line including swim. I was having a fun time with friends sneaking into hotel pools or traveling far and wide to discover places to swim, so I was known to always have multiple swimsuits on hand at any given moment. I was laying on the couch one evening contemplating my career and it came to me to start with swim, create a world around this lifestyle that I love and focus on a niche that I could really speak to and show off to the world, if that makes sense. Did you have any previous design-based experience before you launched the brand? Yes! I studied Fashion Design at FIT in New York, graduated in 2006 and designed in the industry for 10 years before launching the brand. I do all of the pattern making and tech specs and work closely with my factory on sampling and production. I’m 100% in and hands on. It is very overwhelming, but I hired an assistant last year who works part time and an intern started this year and works one day a week. Not sure how I could do it without them. We handle all customer service and shipping, but I am finally learning how to trust and let go of some aspects, they take over and are such fast learners - sometimes I need a vacation too! We love your shoots, Instagram and super strong imagery. How important is aesthetic to NU SWIM? Thank you! Luckily, art direction and branding are amongst my passions, so to be able to do that on my own terms are just some of the perks.. so glad to hear you and so many are enjoying it as much as I do. What should a swimsuit be? Simple, multi-functional and comfortable to wear. I know that sounds really basic, but because I’ve been living in swimwear beneath my clothing since I was very young, the concept makes complete sense to me. And what shouldn’t it be? Fussy, itchy, irritating, too loose, too tight, uncomfortable. Obviously what you swim in has a factor in all of this and we unfortunately will not cure your skin of stickiness after swimming in the sea, but hope to make you as comfortable as possible. Can you describe the kind of girl you’re catering to? Someone who is adventurous, but likes the simple things in life. I am definitely not a simple person, I really do love stuff….so having a swimsuit that has everything I need, makes my life easier. I try to take the day off and drive up to Bolinas (Northern California) every Sunday - I turn my phone on airplane mode and don’t check emails until Monday morning, that’s one of my favourite ways to unwind. Also - cooking, music on the loudest possible volume, walking with no agenda, dinner and drinks with good friends, design research. And finally, how important are ethics and sustainability to your brand? Very important! I worked in corporate design for a long time, and it really made me realise how closely I want to be to my product. When I was working corporate design, from start to finish there were too many steps that I became uninvolved in and that is not why I became a designer. I want to be there every step of the way, bettering the lives of those who I work with by learning from each other and reminding each other that we are not curing diseases. I usually spend 2-3 days per week at my factory and have an incredible relationship with them. The more I show them I care, the more they care about my product and the better they become at their jobs. That is most important to me. I am not saving lives, but hoping to better the lives of those I work with, even if we are a small piece in the world! Thanks for chatting to us Gina! For all things NU SWIM, head over to their website. 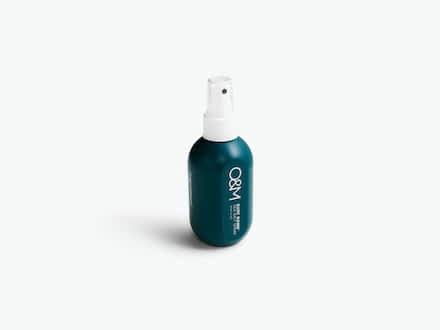 Master the art of salty beach waves with O&M’s Surf Bomb - just spritz in, scrunch up and swim.